Buried under piles of toys? Overwhelmed by all the school notices? No need to drop a ton of dough on organizing products. Just follow these three easy steps to conquer kid clutter once and for all. Step 1: Make it a family affair. I’ll admit it: There are times when the mess in my house gets so overwhelming that I sometimes resort to grabbing a garbage bag and threatening to throw away anything that doesn’t disappear from my sight immediately. It gets my kids to clean up – and quickly – but it’s no fun for anyone. To avoid these mommy meltdowns, we’ve instituted the “clutter control patrol,” where the kids have to scour the house for anything not in its place. We set our microwave timer for five minutes and see if we can get the job done in time. The kids like the race, and I like the clean house. If your kids are older, try assigning them jobs during major clean-ups based on their strengths. 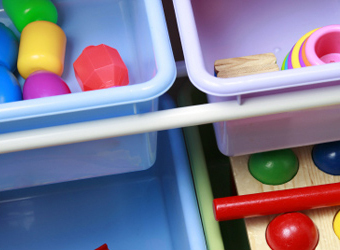 If one child is great at organizing, have him design storage solutions while another child is in charge of purging old and unused toys. Step 2: Create storage where you need it. The key to controlling clutter is twofold: Everything needs a home, and that home should be in the area where the items are most used. Are you constantly tripping over backpacks and sport equipment? Try placing large bins (make cute ones with your kids by having them decorate a large cardboard box) by the door so your kids can toss in shoes or gloves and anything else that often winds up on the floor. Is it the endless school paperwork that drives you insane? Invest in some inexpensive accordion files for your child to keep papers in. Label each folder with a title such as “For Mom and Dad” for permission slips and other papers that need your attention; “Homework,” and “Projects to file.” Remind your child to keep the file where she usually empties her backpack to make staying organized easy. If toys or art supplies are your problem, take some empty shoe boxes, label the front with what’s inside—crayons, paint, tissue paper, etc.—and stack them up on the shelf or in the closet. Keeping things separate makes it easy for even the youngest kids to clean up supplies, and to find them again. Step 3: Get into the habit. Your kids get dressed, brush their teeth, and possibly pack their own lunch. So there’s no reason why they can’t also be responsible for cleaning up their clutter on a regular basis. Build it into your routine. For older kids, institute a daily clean-up time before they’re allowed to watch television or talk on the phone. If your children are little, make it fun by singing silly songs or by pretending aliens are coming to steal their left-out toys. Chances are, they’ll quickly learn to put things away as soon as they come in the door or are done with them, and setting aside a clean-up time won’t even be necessary!